Cleansing Conditioner for Curly Hair is rated 3.9 out of 5 by 35. 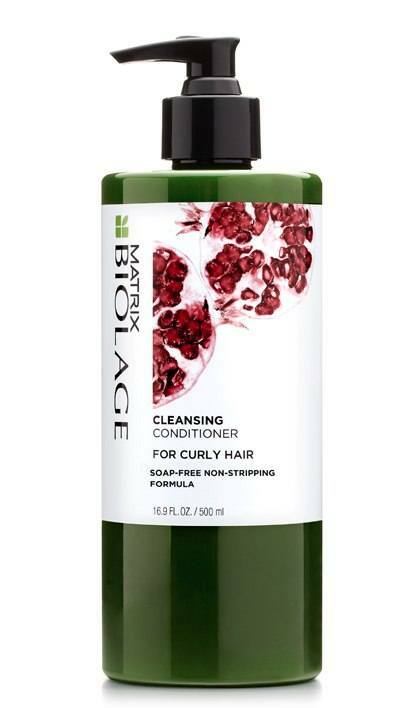 Share https://www.matrix.com/biolage/cleansing-conditioner/cleansing-conditioner-for-curly-hair Cleansing Conditioner for Curly Hairhttps://www.matrix.com/~/media/matrix us media library/2016krakenimages/biolage_cleansingconditioner_cleansingconditionercurlyhair_b-cc-chc.jpg Preserves and defines the structure of curls. Low-lather Cleansing Conditioner for curly hair with Pomegranate provides thorough cleansing and lightweight conditioning to enhance the definition and natural bounce. Suitable for daily use or in between traditional shampooing. - Preserves and defines the structure of curls. Apply to wet hair. Use 6-8 pumps depending on hair length and density. Distribute evenly and gently massage until hair is completely saturated. For best results, leave on for 5 minutes. Rinse thoroughly. In case of contact with eyes, rinse them immediately. Rated 5 out of 5 by Desiberry from Fantastic to use The whole family has been using this for over a year. From wavy to ringlets it works phenomenal. The first week or two I did have an adjustment period and noticed a bit more of greasy hair but after my hair had gotten use to this it was beautiful! Rated 5 out of 5 by 1kim9 from Love, Love, Love this product! I was turned onto the Biolage Matrix Cleansing Conditioner from my hair stylist, and I initially used the type for thick hair as that best suits me. I try to buy the largest bottles available (the 39 ounce size), and was finding that the thick hair was no longer available, so I switched to the curly hair type. I was not disappointed at all; the curly hair type is lightweight and I just love the scent!!! I have been using the cleansing conditioners for 3 years now and the change in my hair is amazing - it's stronger, softer, and so much healthier, and I think the cleansing conditioners are to thank for it. I have almost waist-length, relatively thick and wavy hair, no history of coloring or perming, and use products like mousse and hairspray less than 10 times a year. I am disappointed that this product is getting harder and harder to find, though. I am not a huge fan of shopping online and the local salons and beauty stores are not carrying them any longer. Any suggestions from Matrix as to where to find this would be appreciated!! Rated 5 out of 5 by lilredirish from LOVE, LOVE, LOVE!!!! I started using this a few months ago. My salon stopped carrying it and I ordered a new one on-line. I love how beautifully defining this is for my curls. I will never have to try another product for my hair again! Rated 5 out of 5 by Kelly Leigh from Great for fine curly hair! I’ve been using this for about 2 years and it has done wonders for my hair! My hair is healthy, easy to detangle and I love the one step process. I’m always getting compliments on my hair to boot! The only thing I’ll use on my hair. Rated 3 out of 5 by cher1148 from Didn't work for my curls! I bought the Cleansing Conditioner for coarse hair because the store did not have this one. I finally purchased the curly formula online. I am sorry I did because this one did not work as well as the coarse hair one. This one leaves my hair slightly greasy and flat. And for me to have greasy hair is a miracle!! The coarse hair conditioner is perfect for my 3B curls!! I will stick with that one!! Rated 5 out of 5 by EveO from I thought the clerk was nuts...me curly hair.... I have not been the kindest to my hair, since 8th grade I’ve bleached or colored my hair ALL the time until about 4 years ago when I decided it was to costly $$wise & hair wise...so there’s I was in one of the isles at a beauty supply store and the pomegranate on the label got my attention, as I was reading it I thought “wow no shampoo just a conditioner that would save time in the shower, but my hair is to broken to use that”, when along came the clerk who forever changed my hair, she took one glance at my hair (no touching, no starring, no fussing) and she said you should use this it will help bring out your curls and then a co-worker called her away to help in the back room. I stood there with the pomegranate label bottle and thought, well I got nothing to loose so why not. 4 years later my hair is AMAZING and I now take THIS shampoo with me on trips too. About me & my hair ... I am a white female, I’m 45 with fine hair, I like to keep it long and I RARELY style my hair other than pulled back in a pony tail. Rated 5 out of 5 by NaeNae from Leaves hair manageable untangled moisturized I have been using this conditioning cleanser for about 10 months and I'm so elated I discovered it . It has been happiness to my hair , I no longer use any harsh chemicals on my hair . I have have to hide it from my family members ,for they love this product so much. This cleansing conditioner is like winning the lottery for your hair . My hairhas grown so much since using it . It so good wish I could explain it better I would like to do a commercial for biolage I recommend this product for all hair types I'm so elated about using it . I highly recommend this product with sincerity and assurance .